Fàilte gu Ceòlas! Tha sinn toilichte gu bheil sibh uile air tadhal air an làrach-lìn againn, is tha sinn an dòchas fàilte a chur oirbh gu seachdain air leth. Seachdain làn ceòl, dannsa, càirdeas is barrachd spòrs na tha ri fhaighinn an àite eile air feadh Alba fad an t-samhraidh. Welcome to Ceòlas! 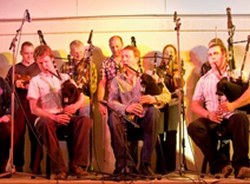 A place full of music, song and dance in the Gaelic Community of South Uist. The main focus of Ceòlas is a music and dance summer school featuring expert tuition in piping, fiddling, singing, Scotch reels and Quadrilles, step dancing and the Gaelic language. It is set within the Gaelic-speaking community of South Uist and explores the vital connections between Scottish traditional music, Gaelic song and dance while allowing ample opportunity for participants to enjoy all these art forms in Cèilidhs and in homes, the places which fostered them. Ceolas however, is working throughout the year offering many different events like concerts, ceilidhs, symposiums, etc as well as working with other people in the community to enhance and encourage our language and culture.